Apple has introduced its largest iPhone ever and a new line of watches that can detect heart problems as it looks to get users to upgrade to more expensive devices in the face of stagnant global demand for smartphones. The relatively small changes to its line-up, following last year's overhauled iPhone X, were widely expected by investors, who sent the company's shares down 1.5 per cent. The strategy has been successful, helping Apple's stock up more than 30 pct this year and making it the first publicly traded U.S. company to hit a market value of more than US$1 trillion. “It is pretty consistent with past iPhone release days where we see short-term sell the news but things will probably get a lot better in the weeks and months ahead, particularly with a strong holiday sales season expected," said Jake Dollarhide, chief executive of Longbow Asset Management. Apple's new phones are the XS, with a 5.8-inch (14.7-cm) screen, starting at $999. The XS Max, the largest iPhone to date and one of the biggest on the market, has a 6.5-inch (16.5-cm) screen, and starts at US$1,099. The company uses the 'S' suffix when it upgrades components but leaves the exterior of a phone largely the same. Last year's iPhone X - pronounced "ten" - represented a major redesign. It also introduced a lower-cost 6.1-inch (15.5 cm) iPhone Xr made of aluminum, starting at US$749. With two phone models starting at US$999 or higher in the United States, Apple appears to be taking advantage of a strong U.S. economy, low unemployment, and rising household wealth. 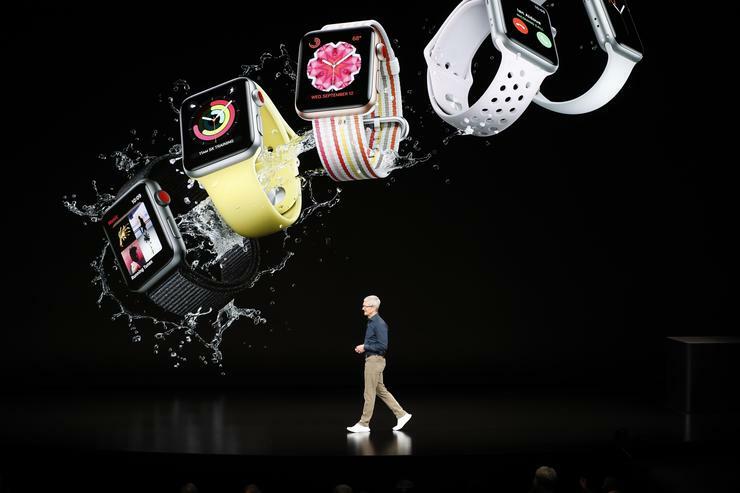 Apple, which is looking for ways to lessen reliance on phones for revenue, opened its event by announcing the new Apple Watch Series 4 range with edge-to-edge displays, like its latest phones, which are more than 30 percent bigger than displays on current models. "This is a pretty big deal," said healthcare tech analyst Ross Muken at Evercore. "This update really establishes the company’s increasing efforts to push the watch as a serious medical device. Apple seems to be diving into heart disease first, the most common cause of death around the world, making serious moves as a health company." Shares of fitness device rival Fitbit fell about 3.7 per cent after the Series 4 announcement. Shares of Garmin lost some earlier gains and were flat in midday New York trade. Executives made the announcement at the Steve Jobs Theatre at Apple's new circular headquarters in Cupertino, California, named after the company's co-founder who wowed the world with the first iPhone in 2007.